​Each week, more Americans tune to AM/FM radio than any other platform. What’s more, according to Nielsen’s second-quarter 2017 Comparable Metrics Report, 93% of U.S. adults 18 and older listen to radio every week—more than those watching television or using a smartphone, TV connected device, tablet or PC. We are in the midst of an exciting time for audio, with more and more ways to listen to information and entertainment. AM/FM radio, on-demand streaming, podcasts, digital radio services and satellite radio are all part of this burgeoning platform. According to the newly released April 2018 Audio Today Report, this audio universe remains a reliable way for advertisers to engage today’s diverse audiences. And as technology continues to evolve, choices for listening will continue to grow, presenting marketers and advertisers with even more opportunities. AM/FM radio is America’s top reach medium, giving it mass appeal among diverse audiences—across generations, ethnicities and demographics. By generation, radio has the largest reach with Generation X (ages 35-54), with 80.5 million listeners tuning during an average month (97% of the Gen X population). This is followed by Millennials (18-34 year olds), with 71.6 million listeners tuning in monthly (95% of the Millennial population). Meanwhile, radio reaches 41.2 million monthly listeners among Baby Boomers (ages 55-64), representing 98% of the Baby Boomer population. Monthly reach metrics are widely used in assessing the digital media world, and here radio also leads the way when comparing data for adults 18+. 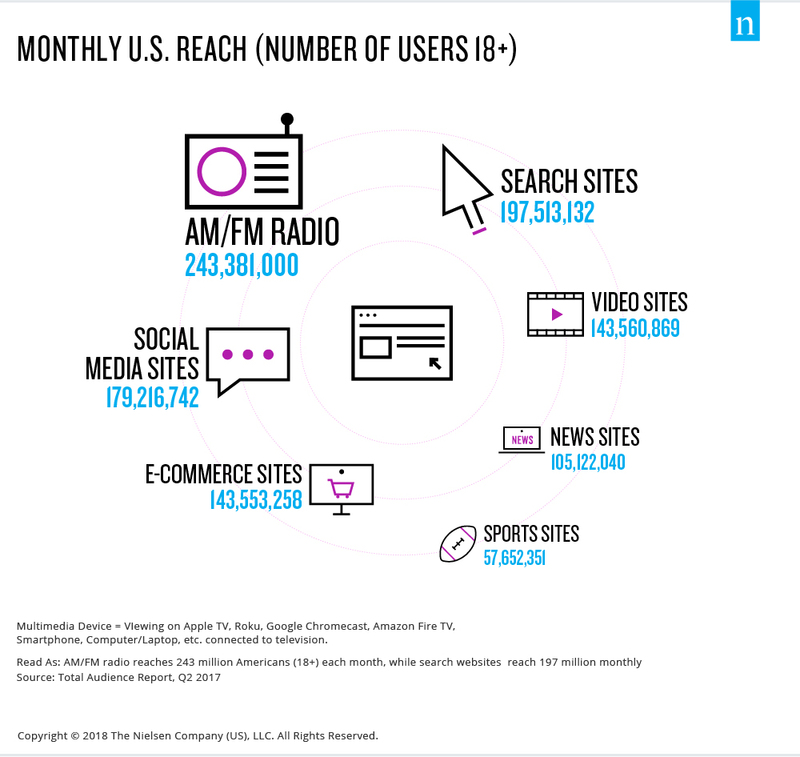 By using Nielsen Scarborough to group together the monthly reach figures for various kinds of websites (including search, social media, video and several others), we see that radio’s monthly 18+ reach (243 million) is larger than the combined reach of different types of digital destinations. ​Network radio, a large and diverse catalog of content distributed on a national basis across hundreds of stations, also reaches a wide variety of listeners. Each week, 94% of all general radio listeners tune to a network-affiliated station—network programming includes everything from 24-hour music channels to sports talk and political analysis. ​When considering today’s expanding audio landscape, it’s impossible to ignore podcasts. With a huge number of podcasts covering every imaginable subject and interest, it comes as no surprise that over 30 million Americans watch, listen or download a podcast every month. While this remains a significantly smaller slice of the audio pie than AM/FM radio, listenership is growing, and smartphones are driving the surge in podcast popularity, with a 157% increase in podcast usage on those devices since 2014! For additional audio insights, download our recent April 2018 Audio Today Report: How America Listens.